Northern Cardinal – These cheerful red birds are native to the eastern part of the United States and Canada, and the population, as well as the range of this species is increasing. At least in part, this is due to the many backyard feeders being installed by bird lovers all over the cardinals’ range. You can easily distinguish the male from the female by its coloring. An adult male cardinal is bright red, with a black face and an orange bill, while the adult female is brown, with a red-tinged crest, wings and tail. She has less black on her face, but her bill is orange, too. A pair of cardinal remains together year round. So if you see one, look closely for its mate, as it will probably be nearby. Generally, one of the pair keeps a lookout while the other feeds. Once cardinals mate, it’s for life. These non-migratory birds build neat little nests out of roots, twigs, hair and string in a shrub or tangle of brush. In spring, the female lays three to four brown-speckled, gray-green eggs that hatch within two weeks. 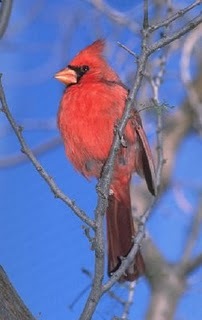 Cardinals are on of the most popular birds for backyard feeders, and it’s easy to attract them to your garden. The most important thing is habitat – having cherry, sumac, dogwood, eastern red cedar, mulberry, hackberry or elderberry trees or shrubs on your property. In addition to eating the berries from these trees, cardinals also call them home, building their nests and raising their young among the branches. Providing their favorite foods helps, too! They love un-hulled black oil sunflower seeds. 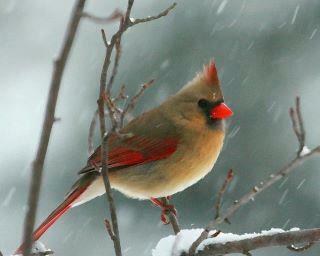 In winter, when they’re really hungry, cardinals will also eat safflower seed and bread crumbs. Cardinals appreciate a year-round source of water. They enjoy having a place to drink and bathe after they’ve snacked on seeds. A heated birdbath provides an unfrozen winter watering spot. By doing these simple things, you’ll be seeing cardinals in your garden regularly. These beautiful birds are a great addition to any outdoor setting.